If you are planning a Halloween party for the grown ups only then this printable invitation Halloween party invitation is the perfect fit. 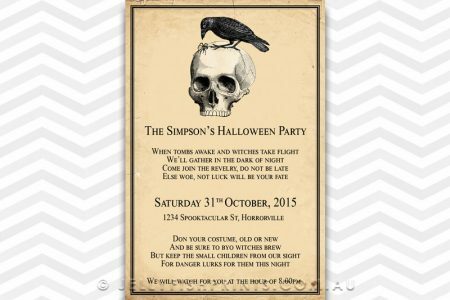 This printable Halloween party invitation has a vintage feel with a nice and creepy motif featuring a black crow and spider upon a skull. It nicely sets the tone for a Spooky Halloween celebration. This printable Halloween party invitation is suitable for an adults only party. Your printable Halloween invitation design will be personalised with your information.